Put the dairy-free yogurt, garlic, ginger, cumin, ground coriander, chilli, coriander and mint leaves and lime juice in a blender and blend for 2–3 minutes until fairly smooth. Season lightly with salt. Put the chicken in a large bowl, pour over the yogurt mixture and toss to coat evenly. Cover with cling film and leave to marinate in the refrigerator for 4–6 hours, or overnight, if time permits. If using wooden skewers, soak them in cold water for at least 30 minutes before cooking. Preheat the grill to medium-high. Thread the chicken pieces onto the skewers and grill, turning frequently, for 8–10 minutes until cooked through and lightly browned. 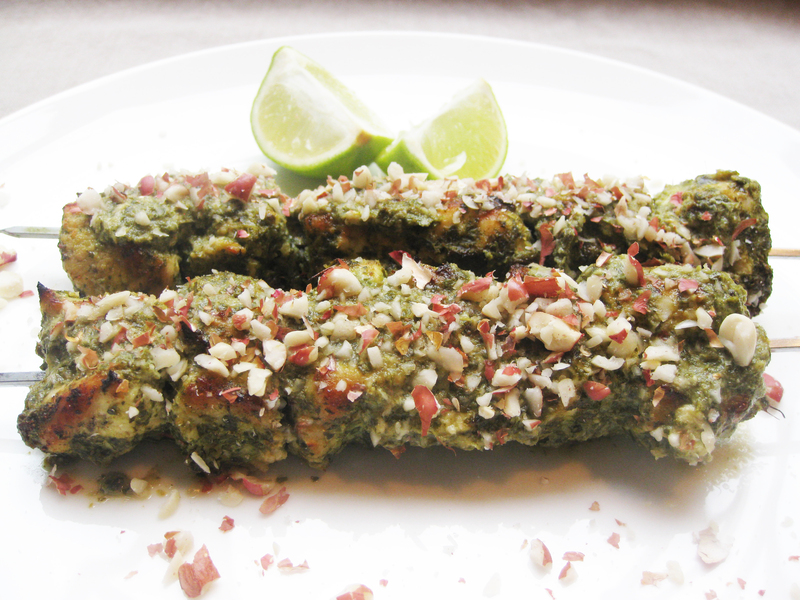 Sprinkle with the peanuts and serve hot with lime wedges for squeezing over. This is truly delicious! The combination of the sweet squash, the earthy mushrooms, spinach and the pine nuts and the fresh, woody flavours of the parsley all combine beautifully with the strong soya cheese taste. Bite through the crispy, light pastry into the soft, melting centre, with the crunchy pine nuts interspersed – and enjoy! Preheat the oven to 1800°C/350°F/Gas 4. To make the filling, put the butternut squash and mushrooms into a large casserole dish and drizzle 2 tablespoons olive oil over. Cover with a lid, shake the dish a little to spread the oil around and bake for about 50 minutes, until the squash is tender. Carefully drain all of the juice out and leave to one side. Meanwhile, to make the Light Pastry, put the potato in a saucepan and cover with cold water. Bring to the boil over a high heat , then turn the heat down to medium and simmer, covered, for 15 minutes or until tender. Drain immediately, then mash until smooth. Sift the flours, salt and xanthan gum into the bowl of a food processor with the dough blade attached and blend to mix together. Add the dairy-free margarine and blend until the mixture resembles fine breadcrumbs, then add the mashed potato and blend for a few seconds until mixed in. Add the egg and blend for 20–30 seconds until the mixture comes together to form a sticky dough. There should be a little extra moisture at the base of the bowl. If it is too dry, gradually blend in 1–2 tablespoons chilled water. If too sticky, add a little rice flour. Shape the pastry into a ball, wrap it in cling film and chill in the fridge for 30 minutes. Heat a large heavy-based frying pan over a medium heat. Add the pine nuts and dry-fry until just starting to turn golden. Remove from the heat, remove the pine nuts and leave to one side. Wash the spinach thoroughly and put in the frying pan. 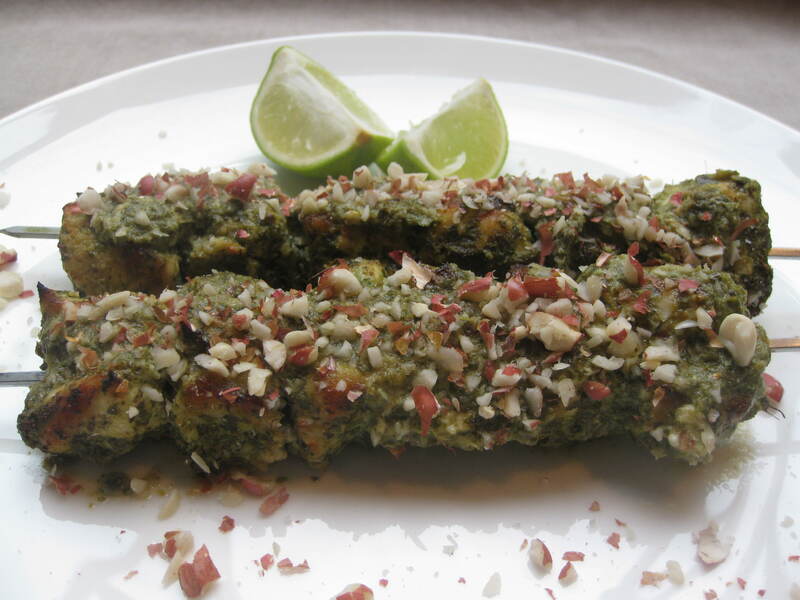 Cook over a medium heat for 2–3 minutes until the spinach has wilted, stirring occasionally. Put the spinach into a fine sieve and push all the juice out of the leaves with the back of a spoon. Drain the liquid from the pan and leave the spinach to one side. Heat the remaining 1 tablespoon of the oil in the pan and add the onion. Fry for about 3–4 minutes until starting to turn golden, then add the garlic and fry for about 30 seconds. Add the flat-leaf parsley and fry for about a minute until just wilted. 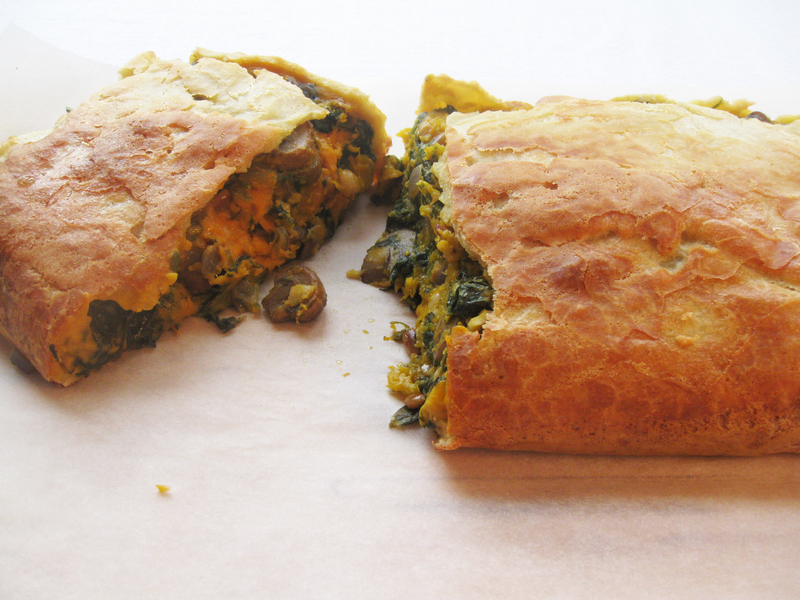 Add the butternut squash, mushrooms, pine nuts and spinach and the soya cheese. Season lightly with salt and pepper and mix together gently but thoroughly. Turn the oven up to 200°C/400°F/Gas 6. Liberally dust a large chopping board with rice flour and roll out the pastry into a large rectangle about 3mm/1/8in thick, about 30cm/12in x 40cm.16in. Be careful as the pastry will still be slightly sticky. Put a piece of baking parchment about 10cm/4in wider than the pastry over it and hold it in place with one hand. Turn the board over and carefully put the baking parchment, with the pastry on top of it, on the work surface. Put the filling in the centre of the pastry, making sure you leave about 10cm/4in on each side to fold over the top. Using a sharp knife, cut a square of pastry away from each corner of the pastry. Discard these pieces or use them to decorate the top of the pastry, if you like. Using the baking parchment to keep the pastry together, fold the two long sides of pastry over the filling so that the edges overlap slightly. Carefully smooth the pastry along the seam with your fingers to secure it. Fold the two short ends of the pastry over just to seal the sides, trimming with a sharp knife if they are too long. Smooth the pastry at the seams again. Using a pastry brush, brush all of the egg over the top of the pastry, particularly at the seams and cut 3 slits in the top of the pastry to let the steam out. Bake for 35–40 minutes until the pastry is a rich, golden brown and serve hot. The combination of the mildly sweet, aniseed flavour of the fennel, the earthy sweet beetroot and the beautifully bland potatoes in this recipe is wonderful. The creamy sauce with cheese flavour offsets all the flavours and adds a soft richness to the dish. Great for a simple midweek supper, with salad and/or a crunchy coleslaw, or with a roast for Sunday lunch. Preheat the oven to 200˚C/400˚F/Gas 6 and grease a large baking dish. Trim the leafy fronds at the top of the fennel and leave to one side. Slice each bulb fairly thinly lengthways. 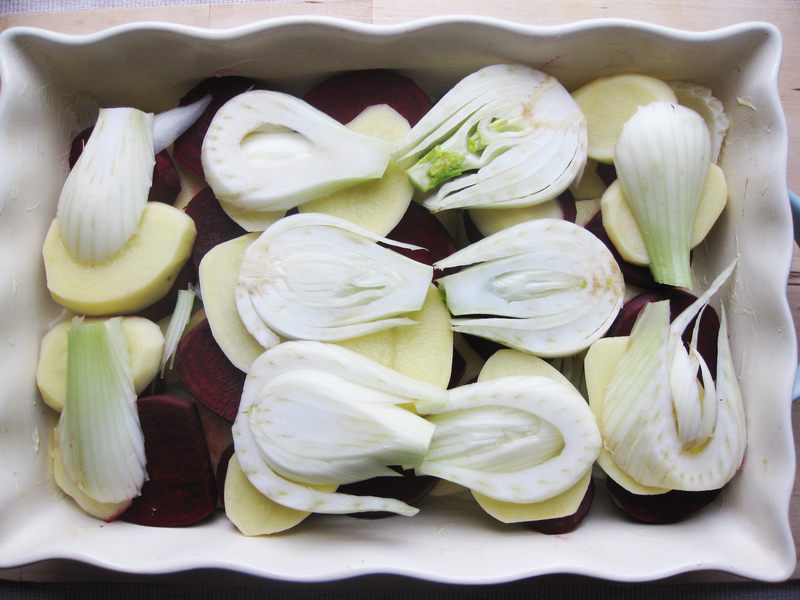 Cover the base of the dish with a layer of half of the fennel slices, season lightly with salt and pepper and then repeat with half of the potato slices, then all of the beetroot slices, then the rest of the potato slices and finally the rest of the fennel slices, seasoning throughout. Pour the soya cream into a jug and add the garlic and half of the grated soya cheese. Pour the cream mixture over the top of the vegetables and sprinkle the remaining grated soya cheese over the top. 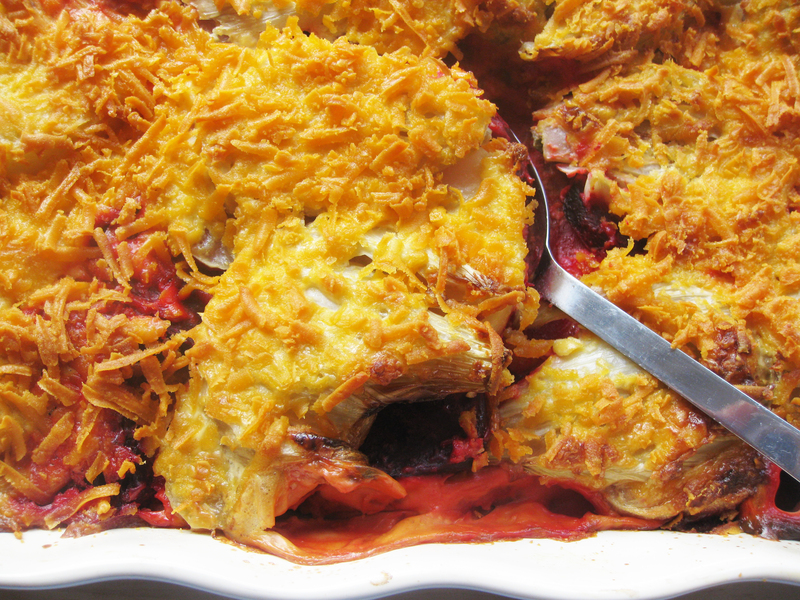 Bake for 40–45 minutes until the cheese on the top is golden brown and the vegetables are tender. Serve hot.